St. Patrick’s Day is very important to the city of Boston. It’s a central part of the city’s heritage and identity. Because of this, celebrations can get a little wild on March 17th as thousands of Bostonians join in on the festivities. Here are the top 10 bars to frequent on St. Patrick’s Day to have some fun. Stop by for a pint or two of Guinness after watching Southie’s St. Patty’s Day parade. Located right across the street from Fenway Park, the Lansdowne Pub is always hopping on the weeknights with live music and great beers. On Saint Patrick’s Day, they go all out – in fact, they go all out for the entire week. Head there on March 17th and enjoy a pint of Guinness. The Burren is a fun, down-to-earth Irish pub located in Somerville, right near Davis Square. Enjoy live Irish music on Saint Patrick’s Day as well as dancing and plenty of pub eats. They have all types of bands here on the weekends, but on Saint Patrick’s Day, expect an all-day event with Irish music. Stop by on the weekend for their Sunday jazz brunch. Located in Central Square in Cambridge, Asgard Pub and Restaurant is a spacious and modern pub, a perfect bar to hang out with a group of friends for Saint Patrick’s Day. Enjoy some Irish music and order up a few pints for a fun afternoon. 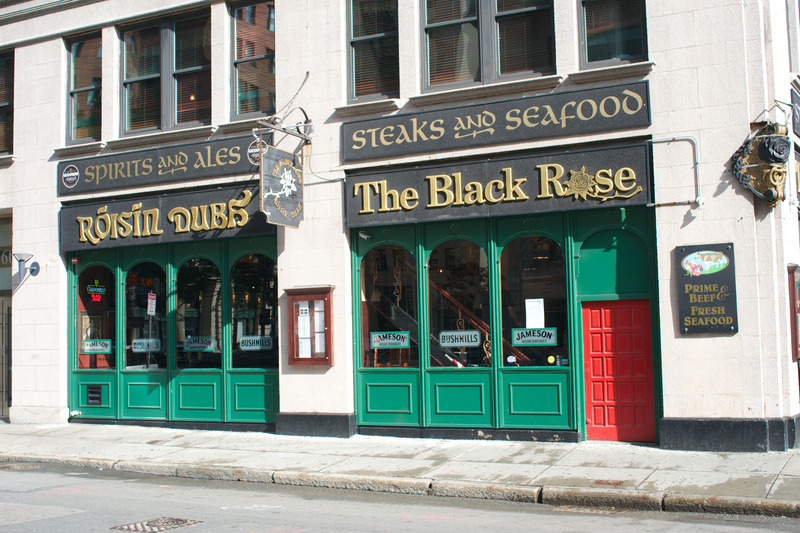 The Black Rose is a neighborhood tavern that serves up hearty Irish cuisine and has live music. It’s one of the older Irish pubs in the city, and it’s authentic, with plenty of ales to choose from in a cozy environment. The Kinsale Irish Pub is a comfortable tavern with a unique design. All of the wood furniture here is from Ireland, and they have a beautiful wooden bar with marble columns. Grab a pint here and enjoy some classic Irish food like bangers and mash. They also have an extensive craft beer selection. Founded in 1909, not long after Saint Patrick’s Day became a City of Boston holiday, J.J. Foley’s is a neighborhood pub. It has plenty of ales to choose from and also has darts for playing some games. Their dining room is spacious, so bring along a group of friends and mingle as you enjoy a Guinness in an authentic Irish tavern. Located in downtown Boston, right near North Station, McGann’s Irish Pub can get boisterous during sports games, but you’ll never miss the game on their TVs. Enjoy the lively atmosphere and listen to some live music as you eat some classic American fare. Voted one of Boston’s best restaurants for their Irish culture and good food, Doyle’s Cafe is a landmark Irish pub, offering a wide beer selection and some rare drafts. Many famous people have even stopped by here for some pub grub. Around since 1882, this one-room bar is a perfect historic establishment in which to celebrate Saint Patrick’s Day and will no doubt be crowded the whole weekend. Mr. Dooley’s is located in downtown Boston and serves up classic bar food. This bar is sure to be packed on Saint Patrick’s Day, so get there early to grab a table or bar stool and enjoy the fiddle sessions that will happen throughout the day. @slevecque is here this afternoon, from 4-6pm!